Leather things are very practical and durable, but it is an issue of cleansing, because the skin can not be washed from the water, she sits down and becomes covered with wrinkles, maybe even crack. Particularly acute problem of dirt removal for light leather things – to them it is very noticeable. First we need to remove from the jacket the stains, if any. Oil should be output using cloth moistened with gasoline or solvent "white spirit". Ink stains are removed with alcohol. The easiest way to clean leather is to wipe it with a damp cloth or sponge. Then you need to wipe the skin dry with a tissue or soft towel. This is the most gentle way, but it does not remove the most stubborn dirt. If a thing is not impossible to clean simply with water, you can try water with soap. In this case, the effect will be more strong. Quite effective cleaning agent is lemon juice. Wipe them with a jacket and in addition clean and nice looking Shine. Besides, the lemon will help kill the smell of gasoline or solvent, if you have been clean off oil stains. When cleaning leather products it is often not just about removing dirt, but about the restoration material. If the skin is dry and rough, you can try water with glycerin. Wipe the jacket with a soft sponge with this mixture, and in addition to cleansing products, the glycerin will make your skin softer. Another way of softening the product and in the batter's box odors – thoroughly clean the thing is orange peel. The essential oils contained in it, will improve skin condition and remove odors and organic acid will help to break down the dirt. Depending on the size of the jacket and the amount of dirt on it, you may need quite a lot of rind, one orange is clearly not enough. But this method has the very important disadvantage – can leave traces on very bright white things. They can be off, but then washed away and the essential oils for which this method was used. To give the product the leather softness and brightness, use whipped egg white. Apply it on the coat, then wipe with a soft damp sponge. After drying, the things you notice results. Unfortunately, it is more a way of care than purification, because the protein does not contain active substances and can remove as much dirt as ordinary water. For gentle cleaning of leather things, you can use milk. This method is very good for light and white garments. Milk will not leave a trace contained in the fats will make the skin soft and elastic. Wet skin is easily stretched, so strongly do not RUB the coat in the cleaning process. Because in the process of cleaning used water or other liquids, it is recommended to give the jacket to hang at least a day at normal room temperature in order for it to completely dry. 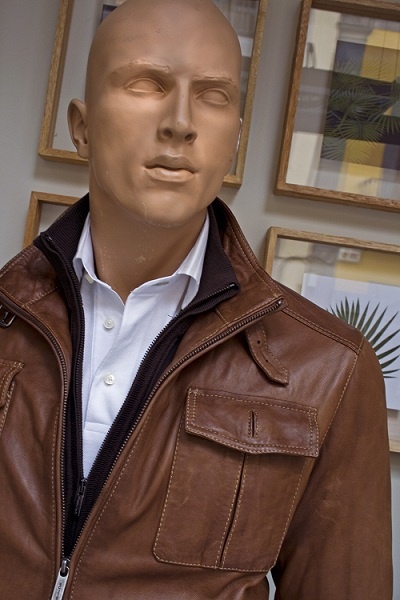 Leather jacket is a classic that never goes out of fashion. With proper care and careful wear leather things for a long time look great. To remove dirt, grease and difficult stains need special care not to damage the skin and does not spoil the color. The most polluted collar and cuffs, where there are greasy stains. To completely remove, moisten a soft sponge or cotton pad with rubbing alcohol, wipe gently and carefully become shiny places. Alcohol gently cleanses the skin not only from stains but also helps remove contamination from ballpoint or gel pens, felt-tipped pen. Stains from dirt remove with a damp microfiber cloth, apply one drop of detergent for dishes, wipe the place of contamination, rinse the cloth in warm water, repeat the wet cleaning. The challenging stains on the jacket of dark skin cleaned with a mixture of equal parts of turpentine and denatured alcohol to this mixture add a few drops of glycerin. Dampen a cotton pad or sponge, carefully wipe off stains, after 10 minutes, make the final processing using a clean soaked in rubbing alcohol. 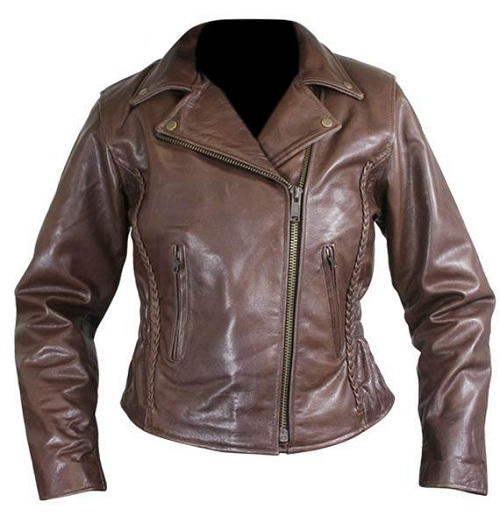 Stains on light leather jacket cleaned with a mixture of water, baking soda and ammonia. When stubborn dirt, pour in a container of 200 ml of water, add 2 teaspoons of baking soda and 2 tablespoons of ammonia. To this mix can add 1 drop of any liquid detergent for dishes. That leather jacket after removal of the stains remained soft, put the sponge a drop of castor oil or glycerin and wipe the entire jacket. This will give the product Shine and protection from moisture. A slurry of the potato starch will help you remove grease stains from leather. Dissolve 2 tablespoons of starch to the thickness of cream, apply on oily spots, leave for 15 minutes, empty the pulp with a sponge, then wipe with a sponge dampened with glycerin. Do not use for cleaning leather goods aggressive substances: gasoline, acetone, kerosene, solvent. If you cannot handle the stains, contact a dry cleaner, where people carefully and for a very reasonable price will remove any contamination.